Camp in the heart of the Italian Renaissance in Tuscany! The birthplace of the Renaissance, Tuscany is home to the most beautiful gems belonging to this artistic movement. Our 3 to 5-star Italian campsites are located in the region’s stunning, picture-perfect landscapes. It’s the perfect location for campers looking to discover all the riches of this region of Italy. In Florence, they’ll be amazed by the Cathedral of Santa Maria del Fiore and its impressive Duomo, the largest stone dome in the world at 45m in diameter. They can lose themselves in the Galleria degli Uffizi or pay a visit to the famous Michelangelo’s David at the Galleria dell’Accademia. In Siena, families, friends and lovers can melt into the crowds at thepalio, a breakneck horse race on sand, which takes place every summer on the UNESCO World Heritage Site of Piazza del Campo. Fun-loving campers should hit the road and head to Pisa, to strike an amusing pose in front of the famous Leaning Tower. Our luxury campsites a few miles from Florence will give you the chance to taste Italian specialities like the Bistecca Fiorentina, steak grilled on a wood fire and seasoned with the famous olive oil of Tuscany, and the Porcetta, a whole roasted suckling pig garnished with rosemary and garlic cloves. And wine-lovers should know that Tuscany is the birthplace of Chianti. To be enjoyed in moderation, of course. 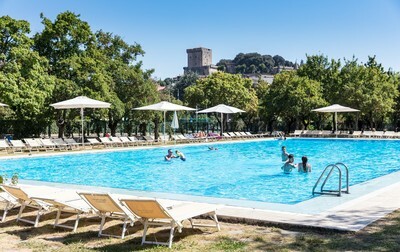 As for the weather, our luxury campsites offer many activities to help you get the best out of Tuscany’s Mediterranean climate and its especially warm summers.